Jake decides the fish is better than the blue dog. If you have a pet store that welcomes you shopping with your dog, you should take your furkid for a trip. We live in a large city and have several stores where we can take the dogs. Getting your furkid out of his usual environment is good for him. He can experience new smells, people and dogs. This can be enriching and alleviate boredom. This week I took Jake shopping. We needed dog food, which I cannot buy in a grocery store. 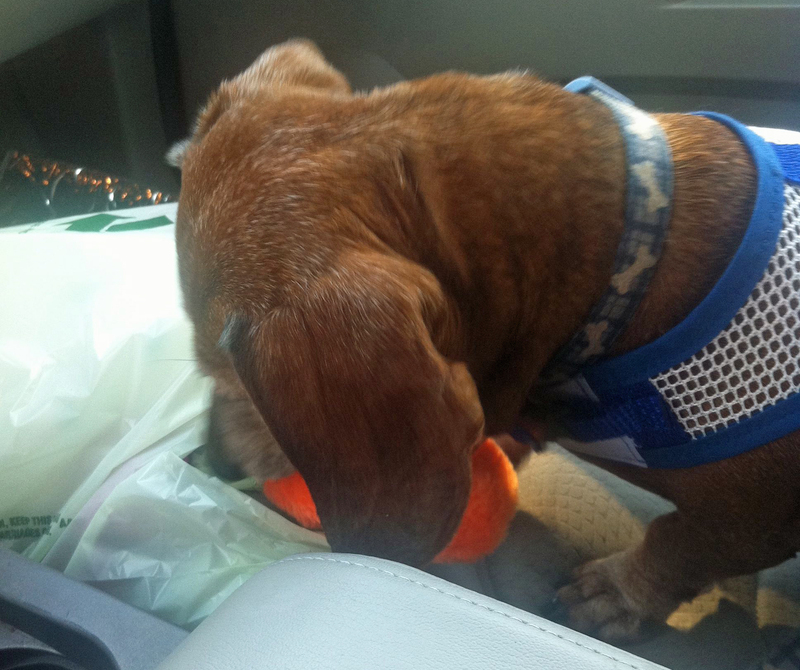 Jake has been an almost perfect little traveler and houseguest, so he deserved a treat. The automatic door did not alarm Jake. He enjoyed sniffing down the aisle, but he was not two minutes in the store before he produced an impressive bowel movement next to the Purina display. After a cleanup in aisle one, we continued our shopping. We got our food and selected some treats. Then we went to the toy aisle. As I said, Jake had been a good boy, so I broke my rule about not spending more than $1 for a dog toy. 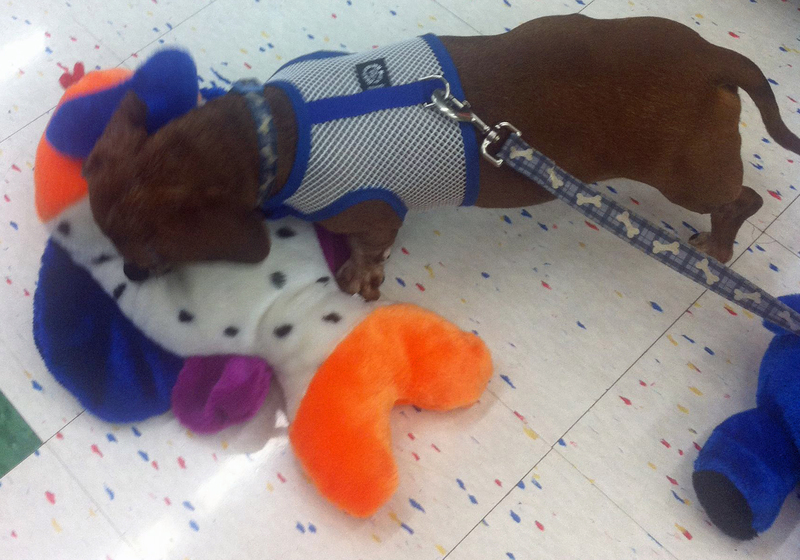 I let him sniff and look at the large toys in the bottom row of the stuffed animals. He kept sniffing at two of them. I put them on the floor, and he selected a large fish that honks. The fish is nearly as big as he is. At $9, it is an investment. After charming five people in the checkout line, Jake watched me carry the bag with his fish in it. Once in the car, he had to get into the bag. Amazingly, the fish is still intact more than 24 hours after I bought it. Maybe I should stop looking for $1 toys and invest in ones as large as he is? We will see. I have started the countdown clock on the fish’s destruction. Jake is ready to go shopping. Jake can't wait until he gets home to play with his fish. 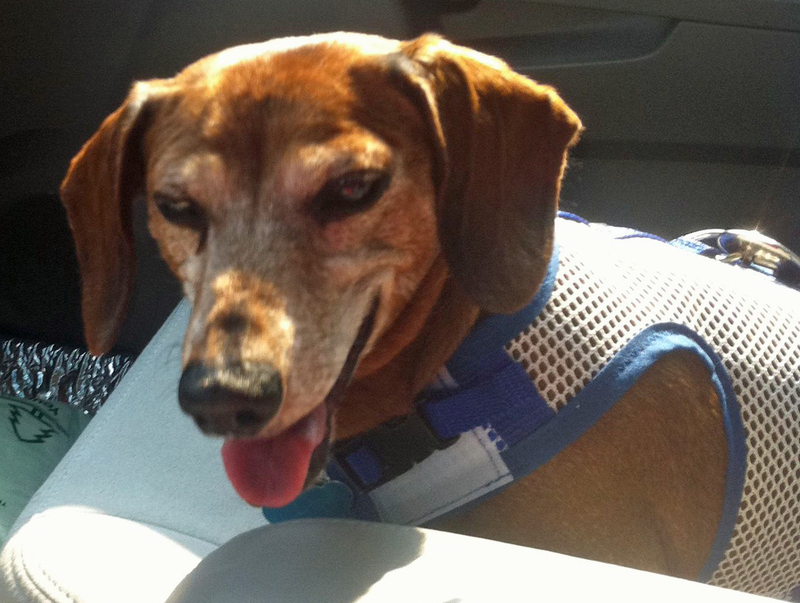 This entry was posted in Dachshunds, Dog Behavior, Dog Toys and tagged Dachshunds, Dog Auctions, dog toys, Pet Stores, Shopping. Bookmark the permalink.